Remember when I announced that #30Authors was going to be a book, thanks to Velvet Morning Press? Well, the time is almost here and, in true #30Authors style, we are going to make it a big social media event in order to connect readers, authors, and bloggers. Starting today, participating authors will be tweeting about their writing process throughout the rest of the month. 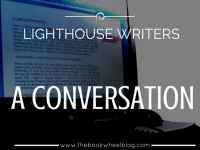 Each author has been assigned a day to be available to answer any questions and to keep the momentum going, with Velvet Morning Press and I helping to facilitate the conversation. The Book Wheel is in the NY Times!